A superconductor is a substance that conducts electricity without resistance when below a critical temperature. At this temperature electrons can move freely through the lattice. High magnetic fields destroy superconductivity and restore the normal conducting state. We expect a magnet moving by a conductor to induce a currents in the conductor by electromagnetic induction. But, a superconductor expels magnetic fields by inducing surface currents. 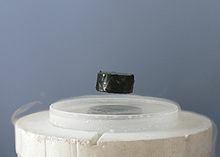 The Meissner effect is demonstrated by levitating a superconductor over magnets or vice versa. A ceramic superconductor was discovered by Alex Müller and Georg Bednorz. Ceramics are normally insulators. A lanthanum, barium, copper and oxygen compound with a critical temperature of 30K. Opened up the possibilities for new superconductors. This page was last changed on 27 July 2018, at 12:35.